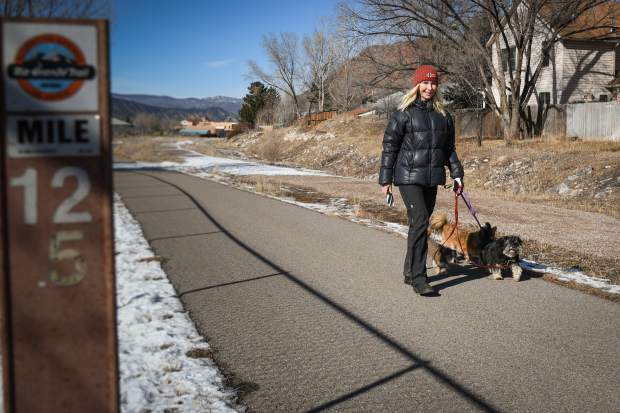 Kristen Bjerke walks her three little dogs on the Rio Grande Trail near Industry Place in Carbondale. The town has secured an easement that serves as a first step to creating a new street connection from Industry to Eighth Street. Carbondale is planning to purchase an easement that will be the first step toward a long-planned connection between Industry Place and Eighth Street. An appraisal in October valued the easement at $143,000, an amount that trustees also included in the 2018 budget. 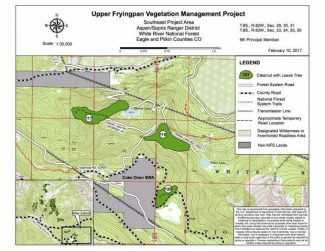 On Tuesday, the board unanimously approved a purchase agreement for the 25-foot wide easement. This easement, however, does not contemplate acquisition of any adjacent properties at this point, said Town Manager Jay Harrington. 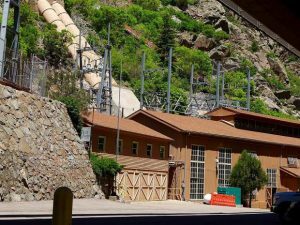 This is only a first step in what would be a long process to create a connection between Industry Place and Eighth Street, effectively creating a link between Colorado Highway 133 and the middle part of town. Several years ago, the town had an agreement with would-be developers of the C’dale Industrial Park property on Merrill Avenue to build the link. But that project never materialized. 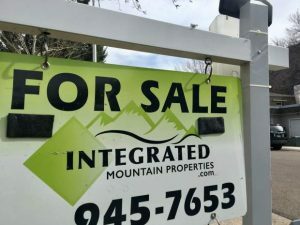 In addition to some land acquisition, the street connection would also require a crossing of the Rio Grande Trail, which would have to be designed and approved through the Roaring Fork Transportation Authority. And the town would have to coordinate with RFTA on any redevelopment the organization plans for its bus barn property on Industry Place. “This is just the first step of the process, which has been talked about for the town for years and years,” said Harrington. The easement does allow the property owner, Primo Properties LLC, to continue using the road for its own construction purposes, as the company plans to build three units in the area. The town expects to get final drafts of a site plan for that project soon. The town will also have to deal with impacts to the road when and if it builds through the area, said Harrington. However, the town’s easement agreement will mean that the property owner cannot construct anything on the road that would get in the way of a future connection. Ben Bohmfalk and other trustees were concerned that, because it could be many years before the town can construct the desired connection, that property could change hands and the new owner may try to contest the stipulations of the easement. The town has other easements that dead end, which adjacent residents use to store their trash and other items, he said. He was concerned that it may be difficult to put a road through an area like that because it has functioned for years like their property. Town Attorney Mark Hamilton encouraged the town public works department to regularly maintain the area and ensure that it is being used only for the allowed “vehicular ingress and egress,” to make sure that garbage cans or sheds aren’t popping up there. Even though the town hasn’t built a road yet, the easement right starts as soon as the deal happens, said Hamilton. There are no squatters rights against the town anywhere in Carbondale, he said. Trustees discussed taking some actions immediately to assert the town’s rights to the easement, such as placing signage indicating that the road is a connection to the new Derail Park that is being developed alongside the Rio Grande Trail, or putting in a gravel path there. But, anything like that will require some further action, said Harrington. Trustee Heather Henry pointed out that this is a great connection from Industry Place to Carbondale’s Derail Park. And the town could immediately assert its easement rights by encouraging cyclists and pedestrians to use that connection, she said. Now that trustees have approved the deed of easement, it will now go back to the property owner for approval, said the town manager.